Parkour is a discipline of overcoming obstacles and embracing your creativity using only your body and your immediate environment. In this parkour challenge, we invite participants of all ages to complete a series of self-directed challenges at their own comfort level using our modular playground. No experience necessary! Participating adults can expect to leave having rediscovered the fun they used to have when playing on a playground as a child. Our facilitators will also lead small-group games for those waiting to experience the main challenge. Those games include Cats and Crabs and Steal the Tail. Both games encourage play, body awareness and communication. In Cats and Crabs, the goal is to remain the last cat in play. The play area is a designated piece of the ground, where all participants must remain throughout the whole game. One participant starts as a crab (moving on all fours, stomach to the sky) and everyone else is a cat (moving on all fours, stomach to the ground). The crab tags cats with his or her hand, turning them into crabs, until no cats are left. In Steal the Tail, the play area is the same, but the goal is to be the last one standing with a tail. Everyone starts in the designated floor area with a bandana hanging out of their waistband. Then participants move around stealing each other’s bandanas without getting theirs stolen. At The Movement Creative, we believe our city is our playground. We teach skills and design playscapes to bring this idea to life for all ages. To us, parkour is a discipline of seeking out and overcoming personal challenges as a part of everyday life. 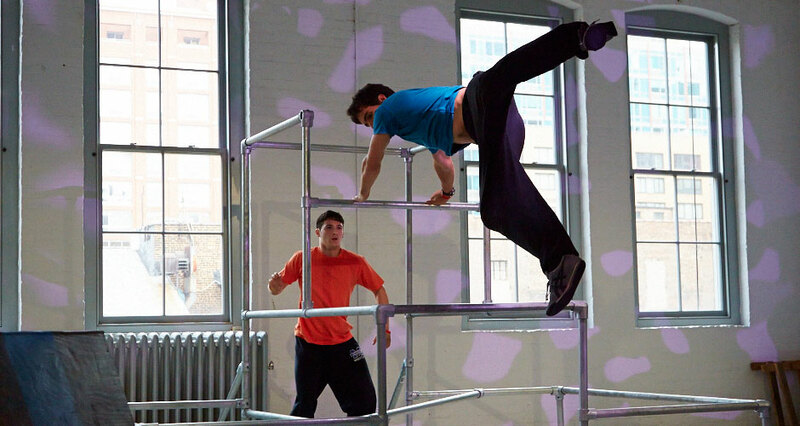 We use parkour help others find daily opportunities for interaction, creativity and play in urban landscapes. Through collaborative creation and partnerships with public, private and non-profit organizations, provide accessible movement education, design playful programming for the public and bring creative services that teach citizens to live a more healthful, active life in their city.